6 storey building under construction with the finished structure of 2950 m2 on a plot of 580 m2 for sale. Rustic plot of 66,000 m² only few steps from Randa mountain, in remotely and fantastically quiet position in the pretty place Algaida, Majorca. Great majorcan village house in 2nd line of the sea in Sa Rapita, Majorca. It is located only 100 meters from the sea and 1,200 meters from Es Trenc beach. Mediterranean style villa with pool and panoramic mountain views in Establiments, only 6 km from the centre of Palma Majorca and 8 km from the beach. 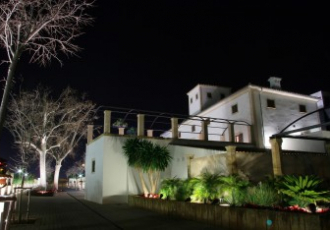 The Possessió is a business and hostelry center placed in Palma, formed by a plot of 5.000 m2 and one ancient Majorcan House constructed in the year 1830, which has .. Magnificent possession of vast expanse of the 18th century. Exceptional property for those who want to acquire a unique and exclusive residence in Puigpunyent, Majorca. Spacious high quality rustic house in S'Illot with antique furniture, works of art and plot with pool and 7,000 m2 of gardens. Large rustic stone house in the upper part of the village of Fornalutx, with spectacular views over the valley and mountains of Serra de Tramuntana. Charming ground floor house, located in Santa Ponsa. It's placed in the quiet residential area of Rotes Velles, on a plot of 862 square meters. Large two storey villa with gardens, private pool and mountain views located in Santa Ponsa. Spectacular villa with modern design overlooks the sea, near Es Trenc beach, built in the year 2010 in Sa Rapita. Mallorca International is a real estate agency directed mostly to international buyers and investors. We offer professional services of buying and selling, management and holiday rental of properties in Majorca. In our portfolio we have apartments, exclusive properties with large grounds, luxurious villas with sea views and much more. Copyright © 2018 Mallorca International Real Estate. All Rights Reserved.